Get your most favorite movie and watch it with your family at this dreamy futuristic home theater. Everyone will dream to have pillar accent, silver touch, and beige tone from this home theater design. Enjoy your time at beautiful blue and violet geometric wall decors that looks attractive. Furthermore, the lighting concept makes this home theater more sophisticated. This home theater design can be made in small room as well. The design is created for small family that no needs extra space. Look at the stars at the ceiling that beautify this room look. When you don’t have more room to create home theater, use living room will be nice. Just add a big TV set to play the movie. Moreover, the fire place and media set will be the focal interest of this room design. Do you love “Pirates of Caribbean” movie? You will remember that film story while enjoy the time with your family. 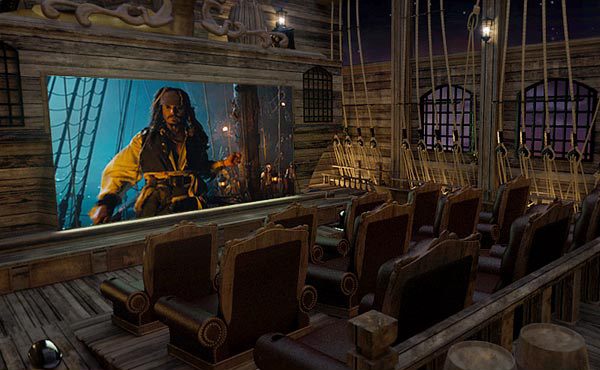 Yes, you may watch other films at this pirates-inspired home theater as well. 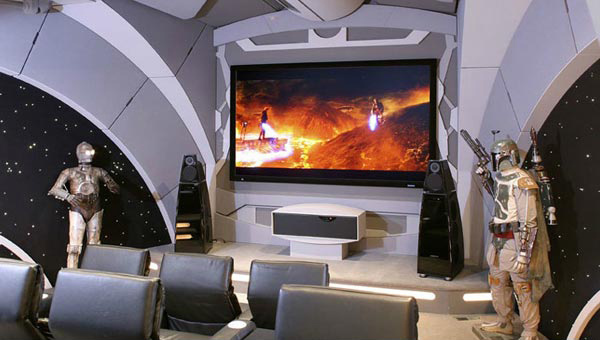 Batman lovers will adore this home theater design. Take a look at the room that designed looks like a real cave. Then, the black chairs remind us about Batman. The industrial lighting also completes this Batman theme decoration. Do you want to watch romantic movie? 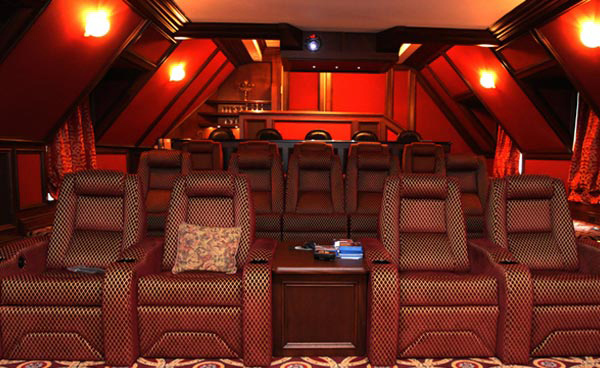 This romantic home theater may support your wish. Seeing romantic movie will make you and your partner relationship goes better. This home theater design may become one of your children dreams. They see their favorite film at a place like they are outer space. Even, they will feel like an astronaut.